With the recent release of Google Play Services v12.5.0 and above, a new feature of Google Play Protect has been added. This security update by Google scans the device for malware and enhances the overall security of device. You can read more about it here. Although this is quite a good addition by Google, it has caused conflicts with MobiLock Enterprise Store application installation on devices. This document details the issue. Since Google Play Application is not Whitelisted or Enabled in Device Profile, this dialog is minimized and user cannot continue with installation. Devices running Android 6.0 and greater. Impacts even Devices which have Device Owner or Silent Install permissions. 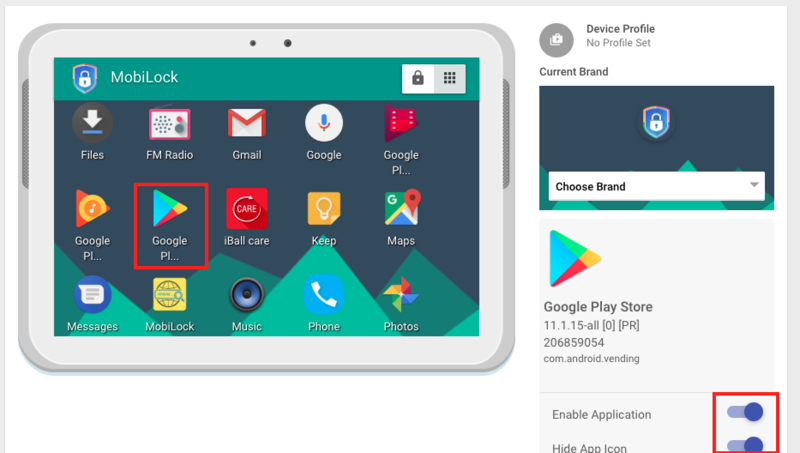 Enable & then Hide the Google Play Store application in all the Device Profiles as shown below and UPDATE the Profile. Well, there is no Permanent fix for this. We as an MDM provider wouldn't want you to disable Play Protect as it is a very good addition at a platform level. The ideal solution would be to upload your application to Google Play Store and distribute it via MobiLock Play for Work applications. Having said that we have added a workaround as described in point 2 & 3below. We have added a workaround starting from MobiLock Android Client app v3.6.7-635 to be released on 8th August. 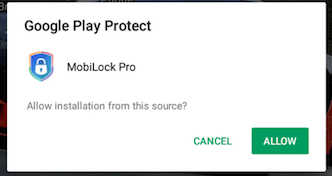 From this release, MobiLock will show the Google Play Protect dialog when the user tries to install the application, so that MobiLock can get the necessary permissions. For Existing devices please upgrade to this version using the workaround and once all devices are updated to this version, the Google Play Store application can be disabled from Device Profile. Please contact Dashboard Support for any queries.